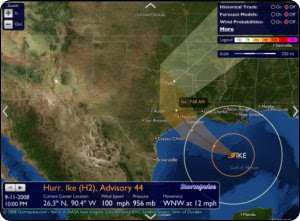 Hurricane Ike is bearing down on Texas and there are more than a few predictions that parts of Austin may temporarily lose electricity as power lines are downed by high winds and falling tree limbs. Although the Color Classic server is back on a UPS (uninterruptible power supply) and uses a very small amount of power it also requires a connection to the internet, which means that a downed Time Warner line that carries phone/video/internet services is also a concern. Regardless, once things are back to normal the Color Classic server will return to action.